Ledbury Market House: Ledbury is a lovely historic town, but not very modern when it comes to hi-tech communications! People may have noticed that after a prolonged absence I created a new blog here on WordPress, wrote a couple of posts, and promptly relapsed back into silence. The reason? My mother has been ill, and I have been with her for weeks and weeks, without access to the internet. Hopefully, she is on the mend, but it made us realise she is ‘no spring chicken’, as she herself reluctantly admits – she is 89 this year, but on good days she insists she feels 19 inside! I wish she lived nearer, then I could pop in each day, but she doesn’t, and I can’t, and my brother is even further away, so we now have carers popping in twice a day to lend a hand and check that Mum is OK.
Friends and family have been fantastically supportive, and I was fortunate to get a couple of breaks: on separate occasions my brother and my elder daughter each held the fort so I could return home for a few days. Luckily, my stint as a full-time carer has been short, and I’m picking up the threads of everyday life again, but the experience has left me full of admiration for anyone who cares for a loved one on a long-term basis – they deserve far more help and support than they get, at a far earlier stage. It was a very worrying time, and dealing with various health and social service authorities became enormously frustrating, but in the end it was the small things that got to me, and the fact that I felt terribly isolated. It sounds very petty to complain, but Mum has no computer, and when it comes to linking in to any kind of modern communications technology the part of Herefordshire where she lives seems to be in something of a black hole. It’s always been a problem when I visit Mum, but it’s more noticeable over a longer period, because there appears to be no reliable ‘hotspot’ that you can link a laptop to, and the mobile phone reception is terrible – there were days when I couldn’t get a signal at all. Even the landline connection is dodgy (though that may be due to Mum’s phone). Calling occupants of interplanetary, most extraordinary craft… Astronaut Tim Peake speaks to Earth from Space more than easily than people do from one part of England to another! I kept thinking how people living in far-flung corners of the world, miles and miles from centres of civilisation, all have access to computer and mobile phones. And what about astronaut Tim Peake, up above in the Earth in the Space Station? He comes across loud and clear when he sends his messages! If he can do it, why not Herefordshire? On the plus side, it gives me an excuse (not that I really need one) to use a picture of the wonderful Tim Peake, who is one of my heroes. While I was with Mum, various people I spoke to all moaned about how awful communications are (there is no decent broad apparently), and on my return home I caught a news item which confirmed that the county is one of the worst areas in the country, and is unlikely to improve any time in the near future. However, it did make me reflect on how much life has changed since my childhood, and how everyone (even technophobes like me) has become reliant on ‘instant’ communication, and the immediacy of accessing information. When I was a child people kept in touch by letter (my mother still does), with the odd phone call when necessary. We were one of the few houses in the street with a phone, and in emergencies other people used to knock on our door and ask if they could ring the doctor or whoever, rather than running to the public phone box round the corner. We had a ‘party line’, which meant we somehow shared it with another house – I’m not sure exactly how this worked, because I think we each had our own number, but it meant we couldn’t use the phone if they were on it, and vice versa. And if they were using their phone you could hear their conversation if you picked up our phone. We used to replace the receiver very quickly, because it would have been very rude to listen in, but we did occasionally hear some very odd snippets of conversation! Hanging on the telephone… This 1950s Bakelite phone, with the ‘cloth’ covered twisted wire cord is like the one I remember from my childhood. Well, much has been written about the country telephone. Ours rings apparently without reason, and with nobody on the other end. If we try to call anyone, we get five people in odd places who are justly annoyed at being summoned when we do not want to talk to them anyway. If I get called to the phone, I always hear another conversation going on, and I get so bemused listening to that that I never hear my own. Gladys may have been writing about her life in rural America, but it certainly echoes my experiences in a small English town. Anyway, I came back from Mum’s feeling grateful for all the things I have – family, friends, house and so on. And it seemed to me that somehow, when communications were less frequent, we had more time for each other, and still managed to keep in touch with people when it really mattered, and to show how much we cared. And I thought it would be nice to try and start writing letters on a more regular basis, to my mother, my brother, my daughters, and my friends, just to show I’m thinking of them. Picture Attribution: Tim Peake, ny NASA/Robert Markowitz https://www.flickr.com/photos/nasa2explore/18306699143/, Public Domain, https://commons.wikimedia.org/w/index.php?curid=41055142. ; Telephone, from Telephone Lines website. ; Ledbury Market House, taken by me a couple of years ago. Well, I seem to have had another of those huge gaps when I haven’t written anything for ages and, as usual, I can’t offer any explanation, except life got in the way. I think for months and months I concentrated so bard on losing weight for our Elder Daughter’s wedding, that I didn’t have any energy for anything else! Anyway, the Wedding has been and gone, and just before that we had Younger Daughter’s Graduation (her second! ), and before that was New Year, and Christmas, and all sorts of other things. Now, since this blog is supposed to be about books, I’m catching up on the few books I’ve read during the last few months – and I’ve moved to WordPress, because I’ve always struggled with Blogger, especially when it comes to uploading photos, and it seems a good time to make a fresh start. My new ‘home’ is a bit of a Work in Progress at the moment while I decide exactly what I want it to look like, and what format it will take. Books, of course, will still loom large, but I want to include a bit more on Life in General, incorporating some of the things I used to wrote about in my original blog (http://chriscross53.blogspot.co.uk/), like walking, places I visited, local history, and things that please me. Quite apart from my struggles with Blogger, I think both the old blogs – and me – got a little tired and jaded, so by rolling them in together I’m hoping to come up with something brighter. And there are few technical glitches I need to sort out. I’ve imported all my Book Trunk archives, but those old categories will have to go – there are far too many of them, and they’re very unwieldy. Then I need to work out whether I can transfer the links to my favourite bloggers, or whether it’s easier to set them up again, and if so, how! It’s been a while since I wrote anything here, but I seem to have been busy doing all sorts of other things, and never did get round to post reviews on some of the bools I read for All Virago, All August. My track record on joining in challenges and read-alongs is not very good I’m afraid – I always seem to fall by the wayside. However, that doesn’t deter me and, like many other bloggers, I can’t resist The 1924 Club, jointly organised by Simon at Stuck in a Book and Karen at Kaggsy’s Bookish Ramblings. They want us all to spend a week in October reviewing books published in 1924, and they say we can include posts which have already appeared, as well as ‘new’ reads. My first reaction was one of sheer horror, because I cannot recollect when any of the books I’ve read were written or published. But when I looked at some of the suggested titles, and the ideas listed by other bloggers, I realised I’ve already written about some books from 1924 (Pink Sugar, by O Douglas, for example). And a quick rootle through the shelves revealed Winifred Holtby’s The Crowded Street (which I’ve read) along with The Rector’s Daughter, by FM Mayor (which I haven’t) and Margaret Kennedy’s The Constant Nymph (ditto). 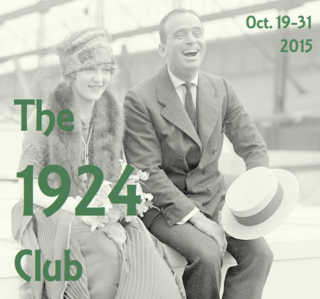 So I should have something to write about between October 19 and 31, which is when The 1924 Club takes place. You’ll find all the details you need at Simon and Karen’s blogs (just click on the links above). They will issue posts so you can link your reviews, and a final round-up, so each participant can see what everyone else has read. 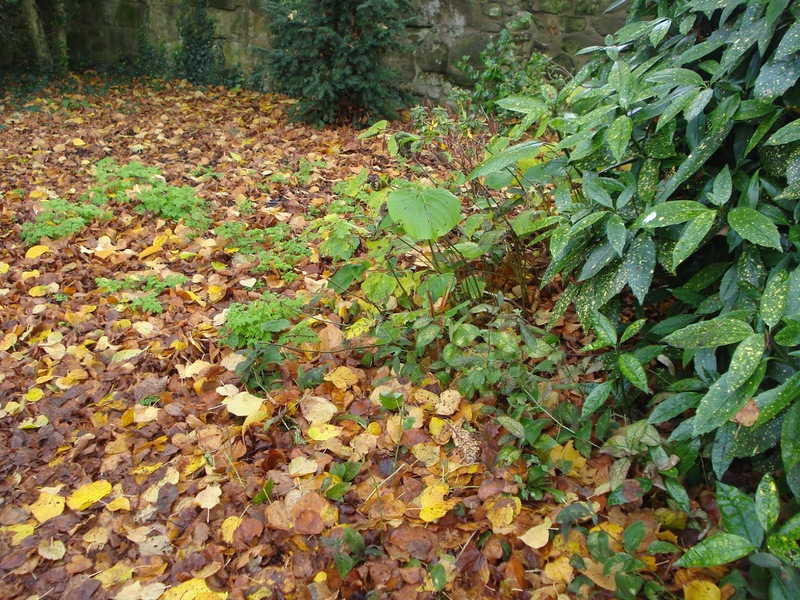 On the theory that example is better than precept, I went out yesterday to rake leaves. This is a job that must be done slowly, in a reflective mood. Also, one must first find the rake. I found it, final, under the pile of leaves raked up last weekend, so the visiting small cousins would have a place in which to practice standing on their hands. Next, one must lean on the rake handle, admiring the scenery, the magnitude of leaf-fall and one’s own courage, the sunny autumn day, and life in general. November in the garden can be damp, dull and drear, but I love the way that in Rural Free, A Farmwife’s Almanac of Country Living, author Rachel Peden manages to link the life of the tree with her own life as a farmer’s wife in Indiana, and how she turns what could be a boring, repetitive task into a meditation, moving from past to present to future, reaching the conclusion that perhaps, after all, she and the tree have both left their mark in their world. I think Rachel is quite right, with her reflections, and found myself thinking along similar lines when I walked in the Castle Grounds earlier this week. There were great drifts of leaves piles up under trees, and in the little, corners where no-one goes, and ridges and furrows of them along the edges of the paths, and a scattering of raggedy yellows, browns and reds blowing across the lawns. It was a sunny day with a gentle breeze, and leaves were falling from the trees like great golden snowflakes and slowly floating to the ground, which was quite magical, and I stood and watched, and thought about how the trees have changed over the year, from the bare branches outlines against the sky and the snow at the start of the year, through the green haze of spring to the lush growth of summer – and now they are returning to that earlier, dormant state. While my leaf mountain grew, I thought over some of the summer’s events that occurred while those trees were growing old. A tree’s fiscal year begins with the separation of one crop of leaves from its branches, where already by that time the tight, pale-brown knobs of next year’s leaves are formed, to swell and shrink all winter, according to the fluctuations of temperature and moisture. Raking up long swaths I reflect that the tree works all year to produce this annual accomplishment, for me to scoop up and carry to the midden behind the barn, where leaves will grow soggy and disintegrate. For the tree, leaves are like my daily chores, of meals, bed-making, floor-sweeping, laundry, which take perpetual energy and leave no record. This started out as a Garden Gaze piece, looking to see what gardening gurus think we should be doing this month, but I seem to have been led astray (up the garden path, perhaps). Rachel’s book is not about gardening – it’s about her life in general, and was published in 1961, arising out of the columns she wrote for a newspaper during the 1950s, and it’s an absolute joy. I discovered it through Nan at Letters from a Hill Farm, (thank you Nan!) and it is an absolute joy. 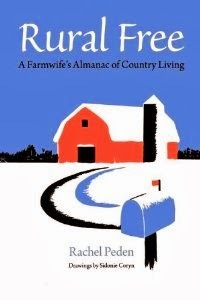 Similar in tone and outlook is Still Meadow Daybook, by Gladys Taber, who also wrote press articles about her life on a Connecticut farm at a similar period. Nan spent a year exploring the women’s lives and writing, and you can find her posts here – do pop over and take a look. After the leaves come down, the countryside has an open look. New vistas appear, hills unseen when summer’s wealth of green is spread, now stand, blue and hazy, in the distance. In the cropped fields the browns and copper and smoky tan make a smoky symphony, not as dramatic as the blaze of October, but lovely to look at. And there is still time to plant those bulbs. 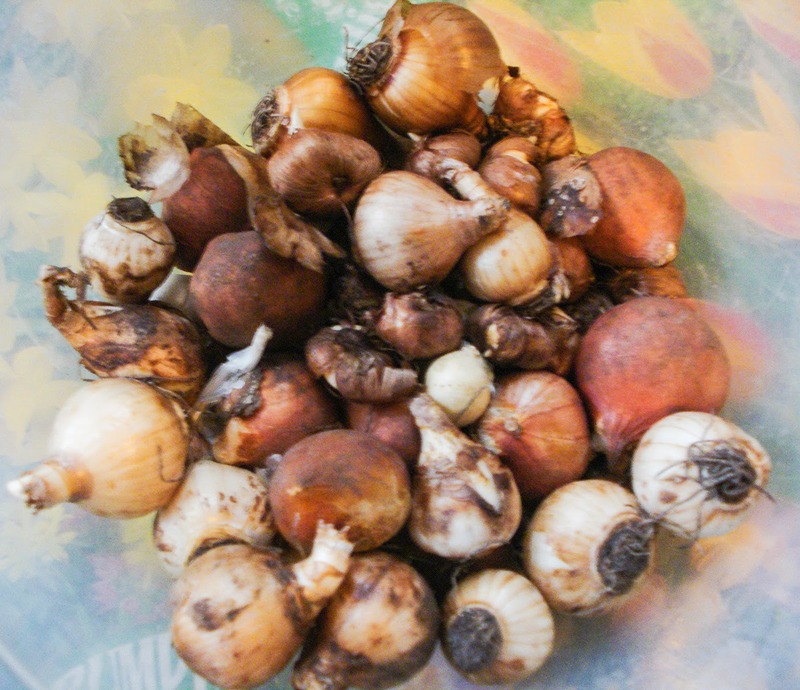 I have often been reduced to planting bulbs at Christmas or even on New Year’s Day, and they seem to come to no harm. There is even an argument deliberately delaying planting now that our autumns and early winters are so mild and wet. According to tulip-grower Steve Thompson, tulips will not start to make roots until the soil temperature drops below 520F (110C), so if planted too early, the argument goes, they will sit dormant in wet soil, at the mercy of slugs and susceptible to diseases. Don’t worry, she says. Chill out. I find this cheering. Even the Provincial Lady is ahead of me when it comes to bulbs – remember how Lady Boxe chastised her for planting indoor bulbs late? But the PL got them into pots on November 7, whereas mine are still reclining (minus soil) in old plastic dishes in the Futility Room. Note to Self, as the PL would say, Must Plant Bulbs. 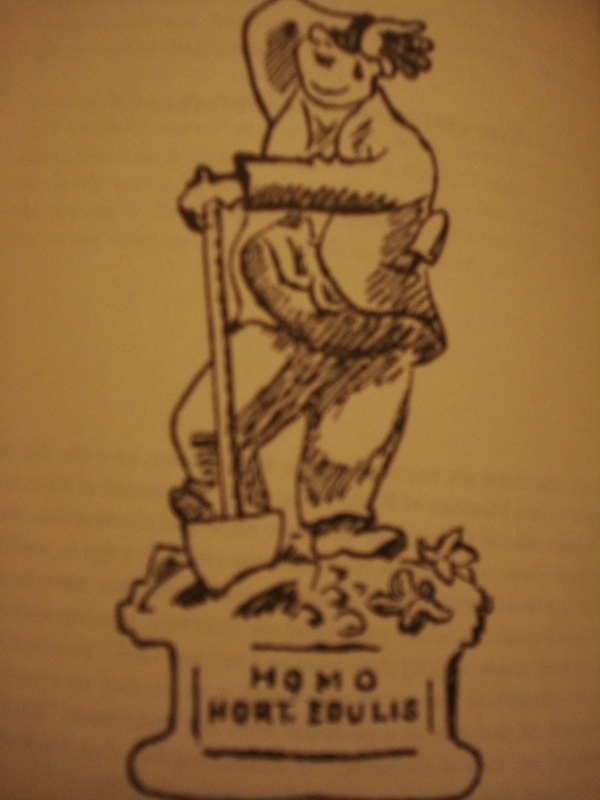 Finally, I can’t resist Karel Capek waxing lyrical in The Gardener’s Year, about the joys of digging and the right kind of soil… my grandfather would have enjoyed this, he was a great believer in the importance of digging. Gardener’s Year by Capek’s brother Josef. Yes, in November the soil should be turned over and loosened: to lift it with a full spade gives you a feeling as appetizing and gratifying as if you lifted food with a full ladle, with a full spoon. A good soil, like good food, must not be either too fat, or heavy, or cold, or wet, or dry, or greasy, or hard, or gritty, or raw; it ought to be like bread, like gingerbread, like a cake, like leavened dough; it should crumble, but not break into lumps; under the spade it ought to crack, but not to squelch; it must not make slabs, or blocks, or honeycombs, or dumplings; but, when you turn it over with a full spade, it ought to breathe with pleasure and fall into a fine and puffy tilth. That is a tasty and edible soil, cultured and noble, deep and moist, permeable, breathing and soft – in short, a good soil is like good people, and as is well known there is nothing better in this vale of tears. It All begins Again, by Helen Hull, published in 1941, was not one of my favourites. Set in America (just before the US joined WW2) it centres on Mary Bristol, now in her mid-seventies, widowed, and recovering from illness. Despite having made a decision never to live with any of her children, she agrees to spend the summer with her daughter Vera, son-in-law Clem at their country house. Mary is reluctant to fall in with Vera’s plan, but lacks the strength to offer any opposition. Vera was like that, insistent and unsubtle in projecting upon someone else the necessity for doing what she herself wished. Mary liked showing her up, and perhaps one reason she didn’t want to live with her daughter was that she knew she’d have to hold her tongue. It was one thing to catch Vera up in an afternoon call, when Vera could take her injured feelings home and forget them in some new scheme. But under one roof! That doesn’t augur well for the future, does it? A happy family life would not appear to be on the cards at all. And what kind of relationship does Mary have with Vera? What kind of mother likes to show her daughter up? As news of the war in Europe filters through Mary remembers other times and other conflicts. She recalls her childhood, when he father returned from a Southern jail, sick and shattered by his experiences fighting in the Civil War. She thinks about her husband Will, and Tom, their elder son, who died after WW1, ‘the neat surgery job done on his interior after Verdun being inadequate for many years of service’. And she listens to her grandchildren, Hilda and Bill, both engaged in conflicts with their parents as they try to select their own paths through life and love. In some ways Mary reminded me of Lady Slane in Vita Sackville-West’s All Passion Spent, perhaps it’s simply because they are both elderly women who don’t really like their grown-up children much, reflecting on the past. But I didn’t find Mary a very sympathetic character (I think it was that early comment about liking to show her daughter up that put me off), and the tone is darker and bleaker. Mary takes a wider view of humanity than Lady Slane does, and she doesn’t like what she sees. She’s not looking to recapture the girl she once was, or to achieve personal peace, harmony and a balance in life – she’s searching for answers to the chaos around her, and her bitterness and despair shows through. There’s a sense of disillusionment here I think. Defeat, by Kay Boyle, was written in the same year as It All begins Again,but is much more to my taste. We’re in Europe, watching French soldiers making their way home after the fall of France. They had found their way back from different places, by different means, some on bicycle, some by bus, some over the mountains on foot, coming home to the Alpes-Maritime from Rennes, or from Clermont-Ferrand, or from Lyons, or from any part of France, and looking as incongruous to modern defeat as survivors of the Confederate Army might have looked, transplanted to this year and place (with their spurs still on and their soft-brimmed, dust-whitened hats), limping wanly back, half dazed and not yet having managed to get the story of what happened straight. Only, this time, they were the men of that tragically unarmed and undirected force which had been the French Army once but was no longer, returning to what orators might call reconstruction but which they knew could never be the same. Isn’t that a haunting scene? And doesn’t it paint the image so clearly? Boyle tells you everything you need to know about the general situation, then moves seamlessly into the way it affects individuals. Here we have two escaping soldiers, who meet with great kindness from a courageous young schoolmistress with French flags and red, white and blue bunting – an act of defiance against the Nazi Occupation. She gives the fresh clothing, and food, and they agree that ‘a country isn’t defeated as long as its women aren’t’. There is more kindness at a farm, where the duo eat bread and soup, and enjoy a glass of red wine before being shown to the attic where they can sleep. Then, in a small town, on July the Fourteenth – the French national holiday – grim reality intrudes, and you suddenly realise that not all women were as brave as the schoolmistress, and that many people did what they could to survive, even if it meant fraternising with the enemy. After his return home one of the soldiers describes what happened, and is surprisingly charitable as he tries to make sense of events. But he has tears in eyes as he thinks about it. I loved this story. It was sad and reflective, offering a very personal view of life in France in the early days of Occupation. And I found it especially interesting read alongside Vere Hodgson’s wartime diaries, Few Eggs, and No Oranges, and the comments she makes about the Fall of France, and the Vichy Government, and General de Gaulle, and the Occupation. 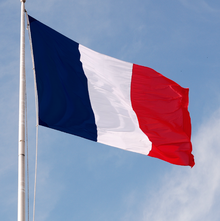 I must find a decent history about war-time France, and try to find out a little more. Finally, I can’t forget Mollie Panter-Downes’ Good Evening, Mrs Craven, written in 1942, which features in a collection of her short stories published under this title (also produced by Persephone), which I reviewed here, and I think every single one of the tales is an absolute gem: the author’s prose and characterisation are faultless. 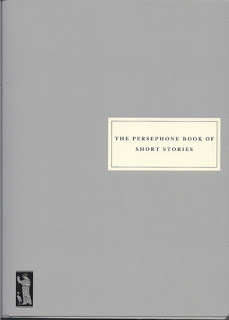 You can tell I’m a huge fan of Mollie Panter-Downes, and if you read nothing else in The Persephone Book of Short Stories, you should read this one. It is quite, quite perfect. Better still, buy the MPD collection, then you can read them all! I meant to write this up in advance and schedule it to appear yesterday (oh, how can I begin to describe the delights of the New Laptop, which does all these clever things at the click of a key!). However, I’ve spent too much time in the garden, then flopped out in my armchair too tired to do anything! So, here we go with another one off the September Book Stack (I’ve been very good so far, sticking to the list, and tying to read one book at a time). Here are my thoughts on The Enchanted Places, the childhood memoirs of Christopher Milne, son of AA Milne – and the original Christopher Robin – and I’m happy to report that it is every bit as enchanting as the title suggests, just as I hoped it would be. It must be difficult to carve out your own path in life when your father is a much-loved author whose books for children have become classics – especially when the world knows you as the small boy with girlish hair, a smock and sandals pictured in EH Shepard’s drawings. I always assumed that at this period all small boys were dressed like that, but thinking about it now I recall seeing a photo of my father as a small boy (he was born in 1922, two years after Milne, so it’s the same time) and he was wearing baggy trousers which came down to his knees, a jumper best described as elderly, and a pair of big boots (and I mean big). But Dad was brought up in the East End of London, which obviously makes a difference. Were all ‘posh’ boys dressed like the young Milne I wonder? Anyway, I digress. 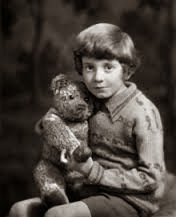 For a time Christopher Milne, who died in 1996, hated everything to do with Pooh and Christopher Robin, probably because he was teased about it at school, but he did eventually come to terms with that created image of his boyhood self, and was able to look back fondly on what must, in many ways, have been a magical period. This book concentrates very much on that part of his life. It does take his story further, but it’s his recollections of the years spent with his nanny (she left when he went to school at the age of nine) that are so enchanting. The family lived in Chelsea, but when Christopher was five his father bought Cotchford Farm for weekends and holidays. It was on the edge of the Ashdown Forest, in Sussex, and the woods and streams and fields became the boy’s playground as he roamed the area playing games with his toys, and this fuelled his father’s creative abilities. There seems to have been some strange kind of symbiotic relationship linking the two worlds of imagination, as Christopher Milne explains. It is difficult to be sure which came first. Did I do something and did my father then write a story around it? Or was it the other way about, and did the story come first? Certainly, my father was on the look-out for ideas; but so was I. He wanted ideas for his stories, I wanted them for my games, and each looked towards the other for inspiration. 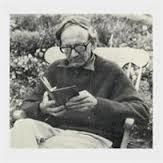 But in the end it was all the same: the stories became a part of our lives; we lived them, thought them, spoke them. And so, possibly before, but certainly after that particular story, we used to stand on Poohsticks Bridge throwing sticks into the water and watching them float away out of sight until they re-emerged on the other side. … came along, looked at the toy Pooh, read the stories and started drawing; and the Pooh who had been developing under my father’s pen began to develop under Shepard’s pen as well…. Most of the places and creatures in the Pooh stories were based on places were based on places and things that really did exist, and those that were made up blended in seamlessly and became part of the story. Only two characters were created by AA Milne: Rabbit and Owl, but Owl’s home really did exist – it was one of several ‘houses’ Christopher established in the trees around Cotchford. With Eeyore it was the other way round: the donkey was a gloomy-looking soft toy, but his dwelling place was dreamt up by Christopher’s father, inspired perhaps by his bedroom and study (the two darkest, dullest and dingiest rooms at Cotchford) or perhaps, by something deep within his own psyche. Wherever that place was, Christopher does not want to go. Nor does he make any effort to analyse the relationship between his parents, or their relationship with him. I like to have around me the things I like today, not the things I once liked many years ago. I don’t want a house to be a museum. When I grew out of my old First Eleven blazer, it was thrown away, not lovingly preserved to remind me of the proud day I won it with a score of thirteen not out. Every child has his Pooh, but one would think it odd if every man still kept his Pooh to remind him of his childhood. I wouldn’t like a glass case that said: ‘Here is fame’, and I don’t need a glass to remind me: ‘Here was love’. Re-reading this, I feel I have let the Pooh connection dominate, but it dominated (and blighted) Christopher Milne’s life. However, the book covers much more that, for he also writes about his time in London, his friends Anne (in the town) and Hannah (in the country), his Nanny, the other servants, and his family life, as well as offering glimpses of his schooldays and later life. It’s written by a man who seems to have overcome the problems which arose from his childhood, and was finally able to break free and establish his own path in life, yet was still able to look back with warmth, humour and love. A Forgotten Novel That’s Best Left Undiscovered! 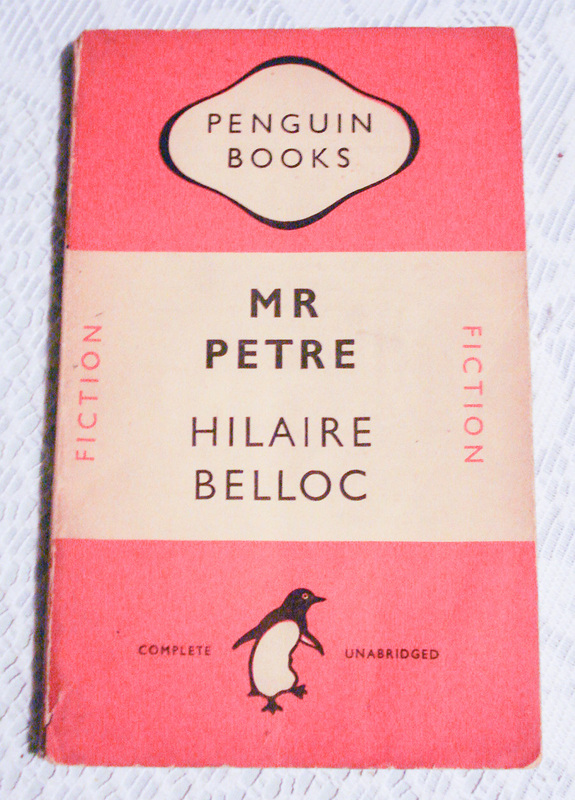 It’s not often I give up on book, but I gave up on Hilaire Belloc’s Mr Petre. Actually, I was going to say I’m sorry to admit I didn’t finish this book, but then I thought why should I feel apologetic – after all, I don’t have to read things I don’t like, or can’t get along with. The days when I had to study books I didn’t enjoy have long since gone (thank goodness), and as far as I’m concerned, reading should be a pleasure, and this one wasn’t. I thought it was a forgotten novel that’s best left undiscovered! Then, overwhelmingly, in a flash, the truth broke upon him. He had lost all conception of his past: every image of it. He knew where he was. All about him, the landscape, the type of railway carriage – everything was familiar, but of any name of place or action or movement in connection with himself prior to that sleep nothing whatever remained. He has no idea who he is, his luggage and despatch box remain unclaimed, and all he has in the world are the clothes he stands up in, £63 in English notes, and a handful of change. A taxi takes him the Splendide hotel – because he is obviously a man of taste and money, and en route he decides he is Mr Petre (or possibly Peter), which is something to go on. He is scared of being thought a fool and laughed at if he tells the truth and says lost memory and can’t remember who he is. So he gives this name at the reception desk, and when the clerk asks ‘Mr John K Petre?’ he says yes. And from that point on our Mr Petre is caught up in a whirligig of events over which he has no control, and no understanding. For John K Petre is a millionaire who has money and makes more, and everyone wants to know him, to seek advice, to make their own fortune. The novel is a satire, targeting financial institutions, and city financiers and bankers and their hangers-on. And therein lies my problem I think, because my mind just shut down when I came to the stuff about investments and such like, and there did seem to be a lot of it. I couldn’t take it in, I didn’t care, and it was boring. I couldn’t even muster enough interest in the characters for them to carry me through: they were dull, flat and boring as well. So in the end I gave up completely, and struck the book on the pile destined for Oxfam – but not before sneaking a look at the end, to find out what happened to Mr Petre, because I wanted to know if he got his memory back (yes) and whether he really was Mr John K Petre (no, but his name is Peter). He has to battle in the courts to clear himself on a charge of impersonation (he insists he never claimed to be John K Petre the millionaire, everyone just assumed he was) and he does get to live happily after, in his own quiet way. I think the idea of making your central character an amnesiac is an interesting concept, but it means you never really know enough about him to be able to relate to him, and his character never seems to develop. Even when he regains his memory he remains remarkably colourless. The novel was first published in 1925 (issued by Penguin 1947, number 633), but is set in 1953, which puzzled me – I thought perhaps it was going to turn out to be some kind of time shift story, and that would explain the memory loss, but this wasn’t the case. It’s not a vision of the future, like Brave New World, or Nineteen Eighty-Four, and the world in which it is set is exactly the same as the world which existed in in 1925, with the exception that cars, ships and so on are referred as rotors (Mr Petre – John K, not our Peter – is the Rotor King). This terminology is never explained, so it’s unclear whether Belloc envisaged a completely new method of powering transport, or whether rotor is merely a euphemism for motor, used perhaps to avoid any possibility of litigation.